RENOVATED 2 BR, 2 Fbth House. Gorgeous EIK w/Vaulted Ceiling, Newer Bath with stall shower, 2nd Full Bath w/ tub/shower, HWF, CAC, Flat Screen TV & Elec fireplace in living room. Washer/Dryer, Adorable bkyd. Bsmt storage. Kitchen was recently gutted and renovated. Newer kitchen cabinets, butcher block countertop, subway tiled backsplash & stainless steel appliances. Large dining room. Newer CAC system. Inviting front porch. Bk mud room w/ laundry. Shed in bkyd. COMMUTERS DREAM! 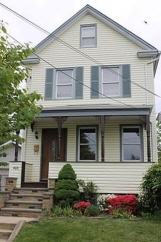 -Located moments to Garwood train station & shopping.